Peaches. How I love them. A co-worker gave me some peaches from his tree. They were so fresh and full of flavor. I couldn't decide what to do with them, except I knew I had to roast them. I've been hearing on my facebook page that people love roasted peaches. They are great on ice cream, plain, and in desserts. Roasting them brought out their flavors, and made them so juicy. 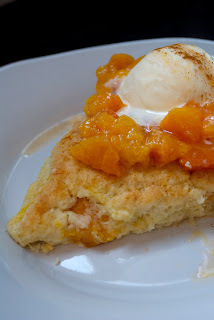 Afterwards, I was craving breakfast, so decided to incorporate some of the peaches into these heavenly Vanilla Bean Scones. Divine. Divine as breakfast, and especially amazing warm with Vanilla ice cream. * I used Vanilla Paste, but you can use beans or even extract. I've included the amounts below. Preheat oven to 400 degrees. Put the butter in a large, shallow baking dish, and put in the oven while it is preheating until the butter melts. In the meantime, wash, half, and pit your peaches. When butter is melted, add in the lemon juice, sugar, and vanilla. Mix. Add peaches, turning to coat in the butter mixture, and then arranging cut side down in a single layer. Roast until peaches are tender, and the butter mixture is syrupy, 15-25 minutes. Brush with liquid halfway through. 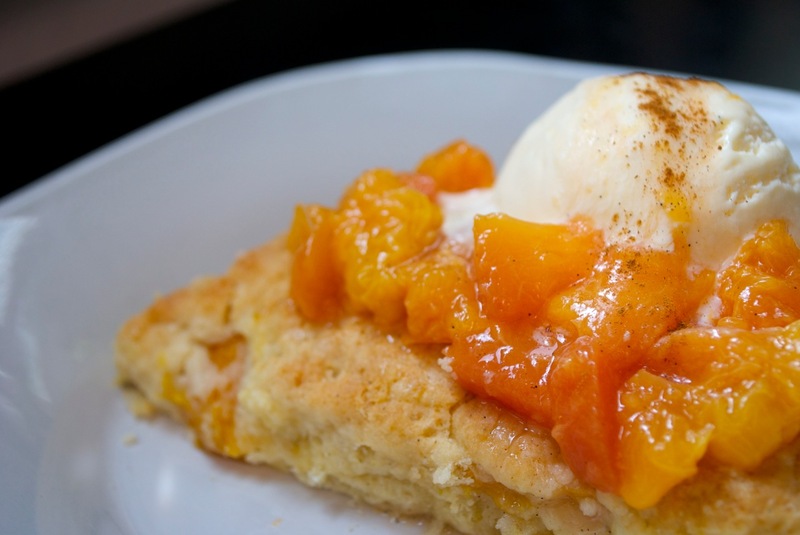 Serve peaches warm, or refrigerate. 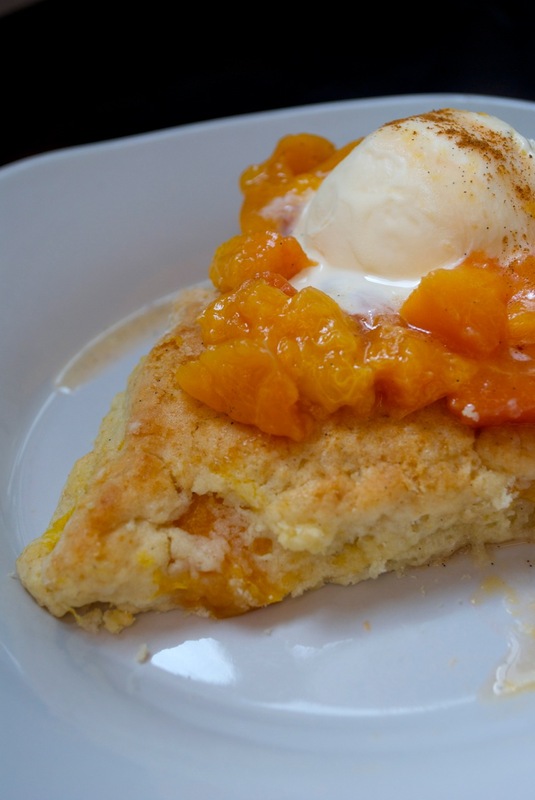 *You don't have to roast the peaches, but it adds a great depth of flavor to the scones. In a large bowl, combine 2 cups of flour, baking powder, salt and sugar. Mix well. Cut in butter and shortening with a pastry cutter or 2 knives. In a separate bowl, beat egg, and add cream and vanilla. Mix well, and then add to dry ingredients. Stir in fruit, and then add more flour until mixture is not wet. This could take up to 1 full cup. Turn dough out onto a floured baking sheet. Press and form into a 1 inch thick circle, just smaller than the width of the cookie sheet. With a pizza cutter, cut into triangles (like a pizza!). Separate the pieces slightly. Brush each scone with cream, and sprinkle turbine sugar on top. What a lovely co-worker to have! I have not roasted peaches before but I can imagine it intensifies everything. The scones look wonderful too. This recipe looks incredible! Thanks for sharing, must try it soon before peaches go out of season! Yum! My stomach just growled. OMG does this look heavenly!